Goodbye fall, hello winter. Fall with its yellows, oranges and reds was literally blown away this week with a winter storm. We've experienced power outages from the high winds, freezing temperatures, and now sleet and snow. The colors from these two ZIA cards reminds me of just earlier this week that now seems so very long ago. 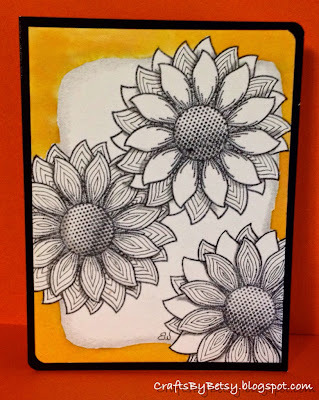 This versatile stamp set is "sunny hello" by Penny Black and is the same stamp set I used here. I started with watercolor paper and stamped the images with Tsukineko Tuxedo Black Momento ink and heat set that. I added the tangles Betweed in the stem and Finery to the leaves. The flower petals are just me practicing auras. 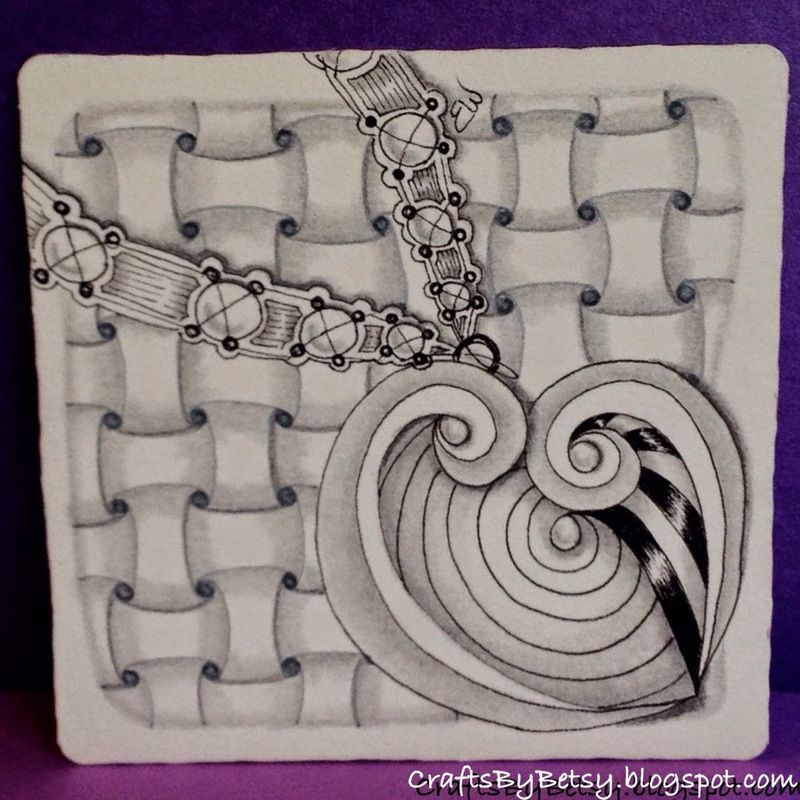 The tangling was done with a Sakura Pigma Micron in black, Derwent pencil for shading and Ranger Distress inks blended with water for color. And I'm participating in the Diva Challenge again this week (#193). It's a "TriTangle" in honor of Veterans and Veteran's Day, representing THX for Trio, Huggins and XYP. 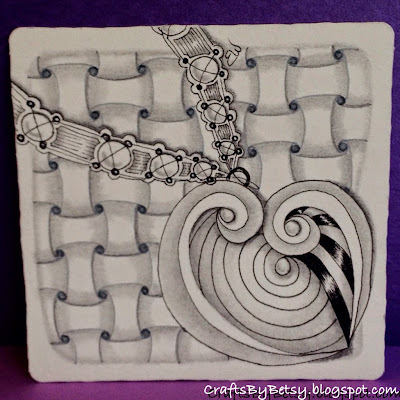 This was done on a Zentangle® tile, using my usual Sakura Pigma Micron and Derwent pencil but I changed things up a bit by using a cool gray Copic Multiliner on Huggins to help it blend into the background. 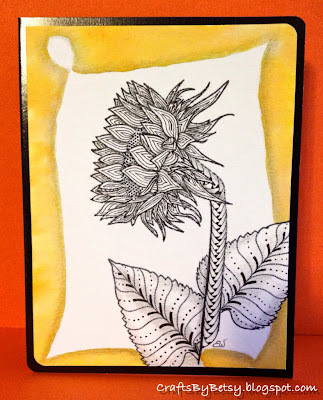 This is the first time I've tried the gray Multiliner on a tile, but I have been successful in the past with my ZIA cards that combine stamping and Zentangle. OH! Your challenge is absolutely gorgeous! Just what I love: elegance, simplicity and beautifully balanced. The trio necklace is breathtaking! Terrific tile! Love the use of the grey Copic. It really makes Huggins sink down and the other two pop up. And I love your shading on Trio. You did very well in making the grey background. A lovely tile in total. Love what you did with Trio. Love the usage of xyp as a necklace...very clever workmanship! Beautifully done!